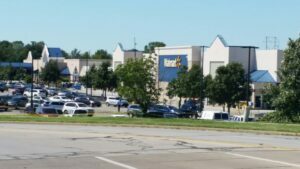 In Shawnee, Kansas, a suburb of Kansas City, Police are investigating a shooting that took place in the parking lot of a Wal-Mart near I-435. According to Police reports, the incident occurred when two suspects approached a woman in the parking lot. As the woman was putting her baby into its car seat, the assailants hit the woman in the head. At that point, a man stepped in to help the woman and was subsequently shot multiple times by one of the suspects. It was at that point that yet another bystander produced a concealed carry handgun and shot one of the suspects, who died at the scene. The other suspect fled the scene but was caught by a K-9 team east of the Wal-Mart. The assaulted mother was taken to the hospital with critical head injuries. Later reports by the Shawnee Police stated that the woman was since upgraded to fair condition and may be released from the hospital soon. The baby was luckily unharmed. The bystander later revealed to be Joshua Owen was shot was also taken to a hospital with critical injuries. Police later said that Joshua was awake and alert, and underwent surgery on Sunday. He is currently struggling with the medical aftermath of his horror. His family has put up a GoFundMe page to help with his medical bills, which you can look at and donate to at this link. As for our concealed carry hero, it was reported that he was interviewed by the police after the incident, but was immediately released with no charges filed against him. This story would have had a much worse ending had it not been for the two hero’s that day. The ending to the story would have been better if the armed hero had blown away both thugs. If the people in Syria etc. had a Second Amendment, they would be better able to take care of themselves like the hero in Shawnee, Kansas. But Obama and Hillary and those they front for need an excuse to trash the Constitution and enslave We the People. So they import Middle Eastern terrorists along with larger numbers of those who are unarmed and defenseless, thus providing a cozy rigged cover story. This then gives aspiring U.S. dictators their excuse to clamp down on innocent Americans who otherwise have the right to defend themselves– clamping down allegedly so as to catch the few intermixed bad apples the crooked double-talking hypocritical politicians let in in the first place. More Americans need to connect the dots and be alert to such scams that operate on fabricated pretexting and then harvesting the results of the pretexting. It isn’t the haystack that the politicians talk about that is their real agenda. It is the dangerous needles that come along for the ride, designed to be useful for the next stepping stone of their hidden agenda– serving the interests of those they front for. Thankfully we still have the right and ability to take such action without penalty of law. Having the courage to take action is the other part of the equation to use deadly force when necessary. Great story. Where is major media coverage for these news stories? We need more good people with guns. God bless them for getting inviolved. Leave a Reply to Randy Crawford Click here to cancel reply.